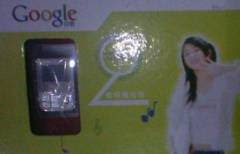 Google Blogoscoped posted a picture that shows Google sell a MP3 player in China. As many people think that would be a fake product, I know many fake products are popular in China. Last month when I was traveling in China, I still found many fake products there. I will not surprise about one day some stores sell fake iPhone in China.